Made you look! 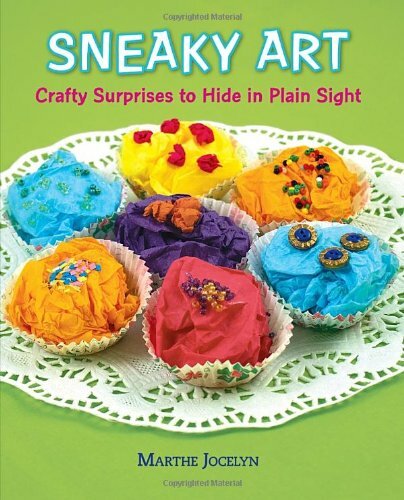 Kids will uncover their inner guerrilla artist in Sneaky Art: Crafty Surprises to Hide in Plain Sight as they sneak funny art projects into surprising places to make people smile! For young artists, tricksters, and crafters, here is a hip, friendly how-to manual for creating removable and shareable art projects from easily found materials. The sneaky part is in the installation! Each work of art is custom-created for display in public places — a tiny cork-bottomed boat in a public fountain, a plate of tiny paper cupcakes on your teacher’s desk, a penny left on the ground for a stranger, a funny message left on your mother’s bathroom mirror, and more. This utterly unique guide — part craft book, part art-philosophy — offers a stylish and sweet "made-you-look-twice" spirit of fun meant to put a smile on the faces of strangers and loved ones alike. Oh what fun this book is!! I am eager to try many of the ideas in this book with my two girls. The purpose of SNEAKY ART is to have fun. It is not meant to be mean, to deface, to be messy, ugly or permanent. There are 24 projects in Marthe Jocelyn's book. She lists all the materials needed and explains step by step how to achieve the particular art piece. The projects use materials you could find in your house: newspapers, magazines, old greeting cards, cereal boxes, corks, colored paper, yarn, ribbons, buttons, etc. One simple idea was to use a pipecleaner to make a flower and then attach it to a park bench. What a nice surprise that would be for someone to find. Another easy one is to use a single glove and stuff it with newspaper or toilet paper . You place the glove on the knob of a door. I think that would bring a smile to anyone's face. Marthe Jocelyn has created a book which will provide hours of fun for your child. Look for it today.